Born on July 6, 1922 in Oak Park, Illinois, John W. Garrett was in a fraternity studying Metallurgical Engineering at the University of Illinois when he heard about the attack on Pearl Harbor. Knowing they were at war, John decided to enlist in the spring of 1942. As an engineer by education, John was sent to Fort Leonard Wood, Missouri for basic training. After basic training, Garrett was assigned to the 14th Armored Division at Camp Campbell, Kentucky. 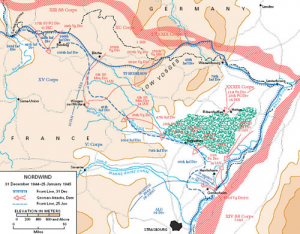 In October of 1944, John and his unit were sent to southern France, where they moved up the Rhine Valley into the Vosges Mountains. On New Year’s Eve night in 1944, John recounts defending against the last major German counter-offensive of the war, Operation Nordwind. 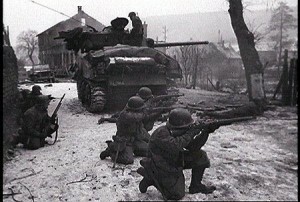 Americans in action during Operation Nordwind. Garrett and his comrades saw almost continuous action towards the end of the war. The strongest attack of Operation Nordwind was halted by the 14th Armored Division in the fierce defensive Battle of Hatten-Rittershoffen, which raged from January 9th to the 21st in 1945. John safely returned home in September of 1946 and worked as a steel salesman and contractor for many years until retiring in 1980 in Delavan, Wisconsin. To hear more of John’s story and many others, visit our Oral History collection.